Before 2013, GAME personnel were involved in small diameter watermain condition assessment. It began with the Investigator+, a versatile short-range tool meant for quick localized inspection and leak detection of small watermains ranging from 150 to 300 mm (6 to 12 inches) while the pipe remained in service. This tool provides live CCTV, acoustic leak detection and locating capabilities by being manually pushed through the system. Through various adaptations GAME successfully managed to expand its inspection capabilities from 75 to 450 mm (3 to 18 inches) and found various ways to maximize inspection distances and minimize setup times. Most recently in the State of Washington, a 350-mm (14-inch) line was inspected to confirm the presence of a silicate surface coating and to determine the extent of the pipe surface coverage with respect to the injection nozzles. It was determined that 50 to 60 percent of the pipe surface was covered over approximately 3.7 metres (12 feet). Suspicion of the material presence was addressed when a routine flushing operation turned problematic, with large pieces of debris getting stuck in the operating mechanism of the hydrant. In addition to owning and operating two Investigator+ units, GAME also owns and operates the LDS1000 (short for Long Distance Survey) with 1,000 metres of cable) designed for inspections in live watermains greater than 300 mm (12 in). 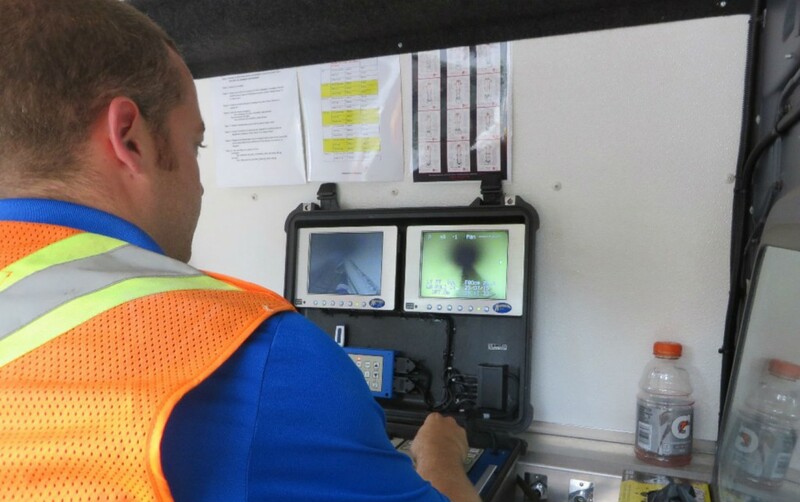 Similarly to the Investigator+, the system offers the same live CCTV, acoustic leak detection and locating capabilities except with the added benefit that the tool gets deployed through the watermain using the mounted parachute which allows it to travel over long distances. GAME successfully deployed the LDS1000 system in a 100-mm (4 in) HDPE pipe. In a more common application for the LDS1000, the company recently completed the inspection and leak detection of six 1,200-mm (48-in) steel watermains and one 1,500-mm (60- in) pre-stressed concrete cylinder pipe (PCCP) watermain in the city of Montreal for Signature on the Saint Lawrence (SSL). This project was completed at the end of March 2016 and its purpose was to examine and evaluate the condition of multiple watermains running parallel through an important construction project. A combined 1,419.6 metres (4,657.5 feet) of data was collected and analyzed, and will be used to confirm the integrity of the mains during and after the completion of the project. The newly-installed access points offer the possibility to repeat the inspections once the construction in the area has been completed if the client requests it. In addition to live CCTV and leak detection, GAME has been called by contractors to identify micro-leaks in new large-diameter watermain installation projects by utilizing an inline cable traction tether system. Being curious by nature, and after searching for new condition assessment tools to add to our tool box, GAME has started providing ROV (remotely operated vehicle) inspections for large-diameter watermains, with distances ranging from 200 to 2,000 metres (650 to 6,500 ft). The company is currently conducting these inspections while the watermains are out of service (depressurized but not necessarily emptied) and can be completed on pipes as small as 350 mm (14 in) and as large as required. GAME was recently called in an emergency situation for the city of Montreal to inspect a 1,200 mm (48 in) bar-wrapped steel cylinder concrete pressure pipe watermain using an HD 40x zoom camera with 450 metres of cable, where it only had a 500-mm Ø (20 in) opening. In addition to verifying each joint, a custom installation was used to complete a laser profile on 300 m (980 ft) of the pipe length. GAME’s equipment, aptly named the FALCON (For All Large CONduits), is equipped with full pan and tilt capabilities, independent track system, and is expandable to accommodate a number of peripherals. To date, GAME has accessed over 400 hydrants and taps with the Investigator+, for a total inspected length of 22,782.7 metres (74,746.4 ft); the LDS1000 totals 32 insertions yielding 12,050.9 metres (39,537.1 ft) and the ROV counts eight insertions covering 2,199.2 metres (7,215.2 ft). Setting up the Investigator+ hydrant. Inspection screen capture(silicate surface debris and silicate surface coating).